Happy Friday everyone! if your like me you are probably wondering where the week has gone? For me it has been organizing, crafting and well trying to pack for my vacation. Yesterday I headed with one of my girlfriends and her Mom to the states for some serious shopping and to pick up my shoes at the UPS store! Of course the serious shopping turned into some serious material shopping, I don't know how Jo-Ann's does it I mean really, 4.99 for felt and then 40% off so I ordered 6 yards yes 6 of this absolutely beautiful dark grey felt and some red and green for a new project I am going to start after I get back. Your going to love it! Today's post is what I made for our trip to Tuscany. 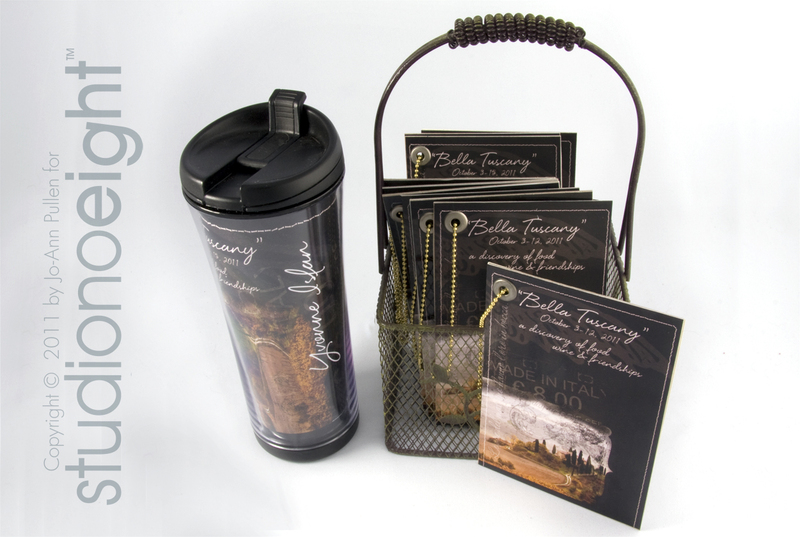 For Yvonne and I, I did those design your own travel mugs, and for each person I designed 4"w x 5.75" h travel tags. the front has the design I created for the trip, with their name and date of the trip. On the back of each tag I did my version of "10 Things I LOVE About Tuscany" with lines and numbers so they can quickly add. Well I should get back to my To Do List, tonight I am doing a demonstration for our Annual Holiday Hoopla Stampin' Up Party. I will post some pics tomorrow for you too see!